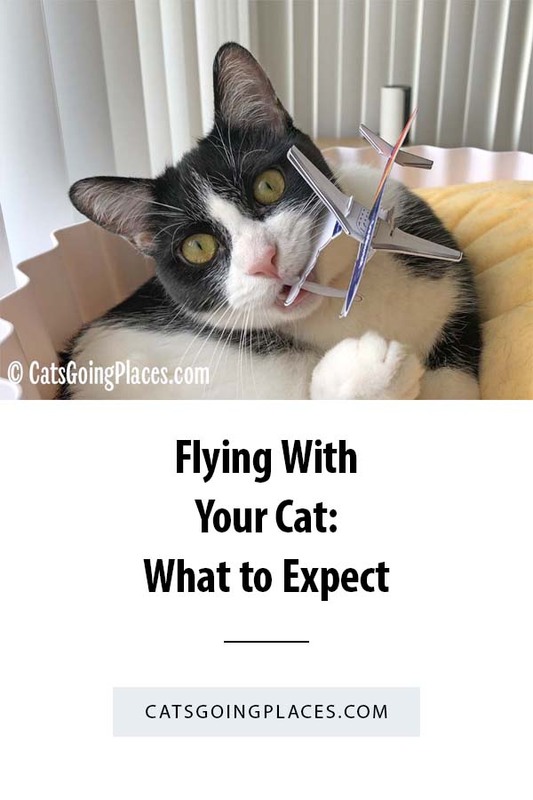 Flying with your cat is a little different than just running for the airplane yourself in the airport. Here’s what to expect. 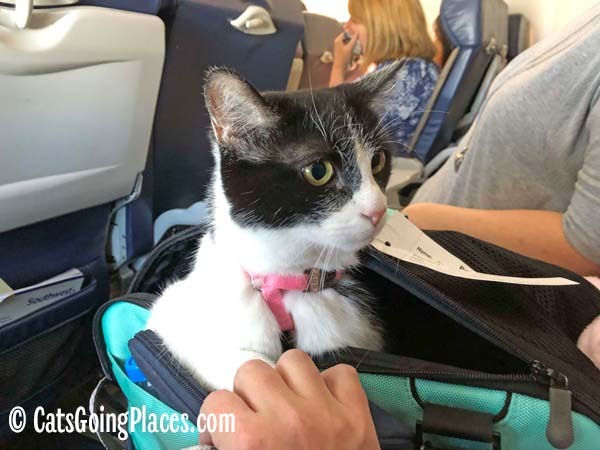 When you first reserve your seat on your flight, you also need to reserve a spot for your cat. Most airlines limit the number of in-cabin pets to two per flight, so don’t procrastinate. Phone your airline and let them know you need a pet reservation. They will add it to your ticket. Some carriers let you pay your pet fee when you make the reservation, but others ask you to check in and pay for the cat’s flight fee the day you fly. I could not find the pet reservation attached to my ticket on the carrier’s web site, so I emailed them through their customer care form. The return email from their customer care team verified my pet reservation so I had something to show if there was confusion the morning of our flight. 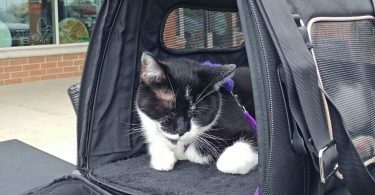 Before you leave for the airport, go ahead and put your cat’s harness on, unless you plan to do it in the car at the airport. Once you’re in the airport, there aren’t really any good places to put it on your cat before you get to the security checkpoint, where she will need it. 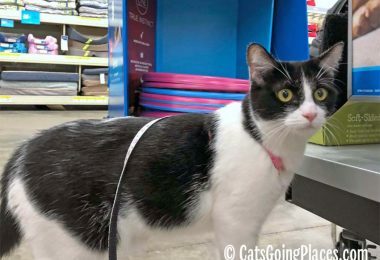 Cupcake wears her harness and her leash throughout the trip. I leave the end of her leash sticking out of the zipper when I close her carrier up so I know I have hold of her before opening the carrier. This is important because she occasionally leaps out of the carrier onto my shoulder when I open it, and I want to be sure I always have a good grip on her when she does this. The day of your flight, be sure to leave extra time to check in if your airline requires you to pay your cat fee on site. Some airports are more efficient than others. There was a frighteningly long line at 4:30 in the morning when Cupcake and I arrived to check in to fly out of Orlando. A whole college bowling team was in line, checking in their special bowling equipment bags! I was glad I had allowed for extra time. The airline employee at the check-in desk will want to see the carrier to be sure it’s really a size that fits under the airplane’s seats. Many airlines also provide a special tag for your pet carrier at check-in to identify it. Once you are checked in, it’s time to go through the security checkpoint. When you get to security, your cat has to come out of the carrier. The carrier must go through the x-ray machine, empty, while you and the cat go through the metal detector together. Just keep a good hold on your cat’s leash so she can’t run if she is startled in the strange environment. Cupcake is conditioned to come out of her carrier and climb up into my arms, and I was really glad at the TSA checkpoint she has had so much practice. Her eyes were huge at all of the noise from the rollers under the baggage and the people bustling around, but she climbed right out. Practice pays off! 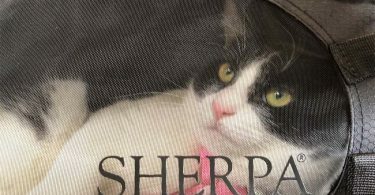 If your cat isn’t used to coming out of her carrier in new environments and you aren’t confident about being able to keep hold of her, you can ask the TSA employees at the checkpoint for a private room for them to do the screening. This allows you to keep your cat in an enclosed space, but it will also cost extra time. Be sure to plan ahead for that delay if you may need it. This hasn’t happened to Cupcake and me, but others flying with cats have been asked to remove the cat’s harness so it can be run through the x-ray machine. If this happens, you may not have immediate access to your carrier, so be prepared to ask for a screening room to prevent your cat from getting loose in the airport. The instructions you get for flying with your cat say she needs to stay in the carrier the entire time, including in the gate area. This is understandable, considering how crowded airports can be. For our recent flight out of Orlando, the airport was mostly empty at 5:00 am. I stopped at the terminal Starbucks to get coffee and there wasn’t even a line. That never happens! I also got Cupcake some whipped cream, and I went to the empty gate seating area near our gate to offer it to her. Since Cupcake hadn’t had breakfast, she was very interested in the whipped cream treat, but she spent the whole time she was eating it watching a man operating a vacuum cleaner at the nearby empty gate area. 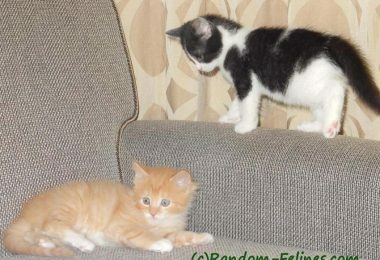 You can see her wide eyes in the photo below as she tracked him. As more people arrived for their flights and started to fill up the boarding area where Cupcake was sitting, she started to get more interested in wandering around to see them. I kept her in her own area away from others and finally put her back in her carrier to discourage wandering since she wasn’t really supposed to be out and I didn’t want to cause any trouble. When you board your flight, go ahead and make sure your carrier will fit in the underseat storage area by your feet. 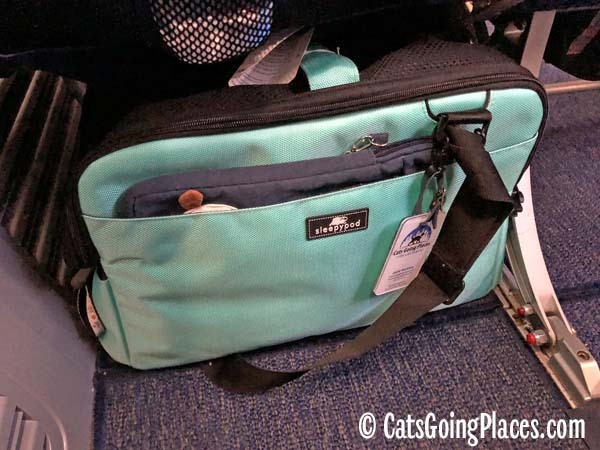 If there is an obstruction, it may only be in your row of seats, so now is the time to get help with moving your seat, if necessary, to be sure your cat’s carrier will fit. On our recent flight out of Orlando, the middle seat in our row, which is normally the seat with the most storage under it, had some piece of equipment hanging underneath. A really, really small carrier might have cleared it, but it would have been tough to squeeze Cupcake’s carrier around it. Fortunately, I had the window seat, which didn’t have any extra obstructions. This is good, because your flight attendant will ask you to push the carrier all the way under the seat, so the area around your feet is clear. Cupcake’s carrier just fit under the seat in front of me. I kept her carrier turned with the long edge toward me both to keep her as near me as possible and also because the area under the seat actually gets lower toward the front of the seat. I think a flotation device is stored in that area. During your flight, your cat may find takeoff and landing especially uncomfortable. From a cat’s perspective, there is a lot of extra noise and vibration that happens during that time. 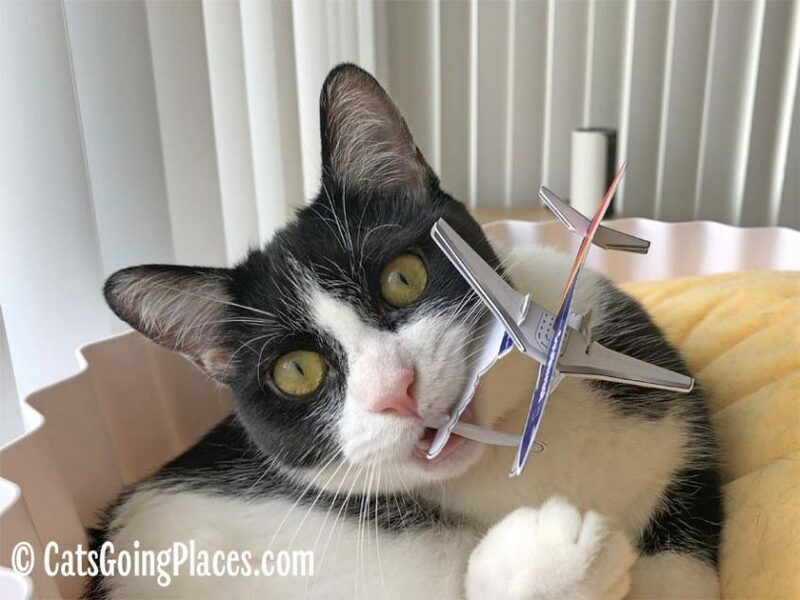 Since you can’t explain to your cat that the change in cabin air pressure will equalize if she swallows, you can reach into her carrier and offer her a few treats or a little bit of water to encourage swallowing. If your cat is stressed out by the flight, she may not want to eat anything. That’s a normal reaction. 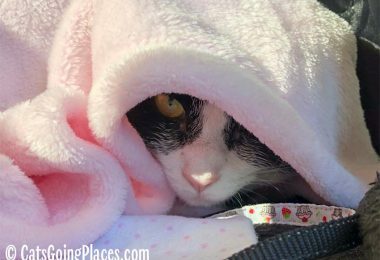 It can be cold on a flight, so I brought a blanket to put over Cupcake’s carrier. Our flights had a surprisingly warm cabin temperature, and when I put my hand in to check on Cupcake, it was especially warm inside the carrier. Needless to say, we didn’t need the blanket for either of the flights, but it’s a good thing to have handy. 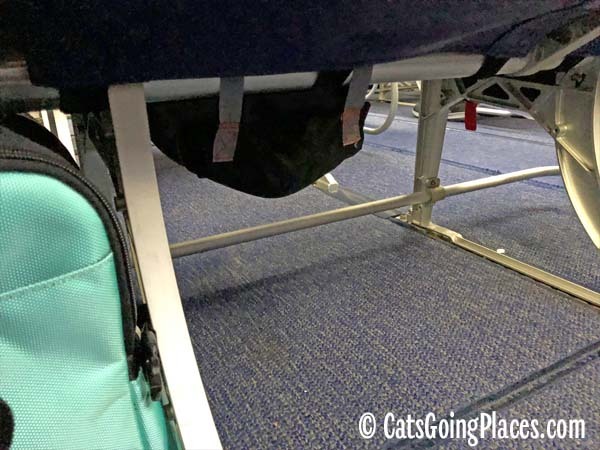 The rules say that your cat has to stay inside her carrier at all times during the flight. There was an empty seat between myself and my friend on our return flight from Kansas City, so I seat belted Cupcake’s carrier into the seat while the flight was at altitude. Cupcake seemed so warm inside the carrier that I opened it enough for her to get a little extra air for a few minutes, something I wouldn’t have done if I was sitting next to a stranger. It is safer for your cat to be in her carrier, since she will be secure inside there during any unexpected turbulence. Have a Great Flight With Your Cat! It can feel really overwhelming the first time you fly with a cat. Just ask the gate agent who checked Cupcake and me in that first time. But it’s not that hard, and you and your cat are in for a big adventure. Let us know where you travels take you! blows my mind that TSA would make someone take a harness off of an animal in an open terminal…. This post made me giggle. Your cat needs to stay in the carrier in the airport, except I didn’t. And your cat needs to stay in the carrier in the plane, except I didn’t. Knowing the rules is important so you know when you are breaking them and you can fix things before you get caught. This is all great info! I will say, even though I am sometimes a little nervous going through security check, it’s still one of my favorite parts because people often admire me! And my human almost always lets me out at the gate, because I’m so well behaved. So far, nobody has told me I have to go back in. That sounds like a terrible experience! They should have let you have a private screening for the cats, just as they would for a pat down. 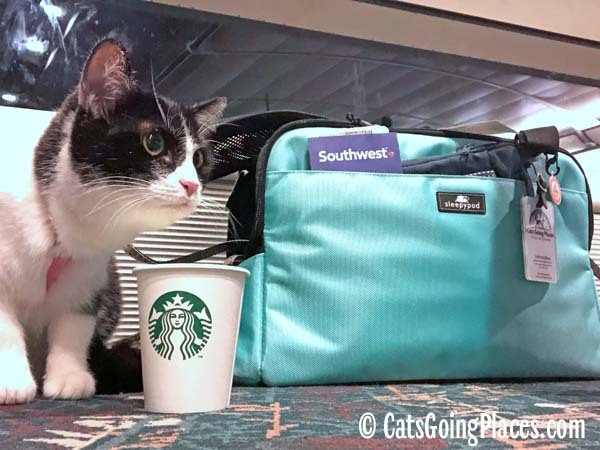 Cupcake and I flew out of Orlando and didn’t encounter this, but I’m hearing more and more stories of cats required to remove harnesses at TSA screenings. This is currently the thick of the spring break travel crush and may have made the TSA personnel less patient than they were for me during a lower volume time of year and at the lower volume time of day. In fact we were on the TSA Pre-check line and there were very few passengers and at least 5 TSA agents working that line. No excuses for the TSA agents’ callous disregard for my cats’ fear and my concern for them.